The 25km Trail Race is graded ‘Hard’ and sits almost halfway between the 10km & 50km routes in difficulty, ascent & terrain you run on. Technical, fast flowing & rugged trails take you around Derwent Water and the Borrowdale Valley with the Watendlath Valley thrown in for good measure. Want more than the 10k, but not up for the 50k Ultra Marathon, then enter the 25k. It will test you to your limit or get you set for longer trails later in the season. Please check the 25k wave system tab below to work out which wave is the best one for you. The 25km route starts from inside Crow Park, heading directly out of the festival site, it then runs through the car park and into Cockshot Woods before crossing the road within 700m of the start. 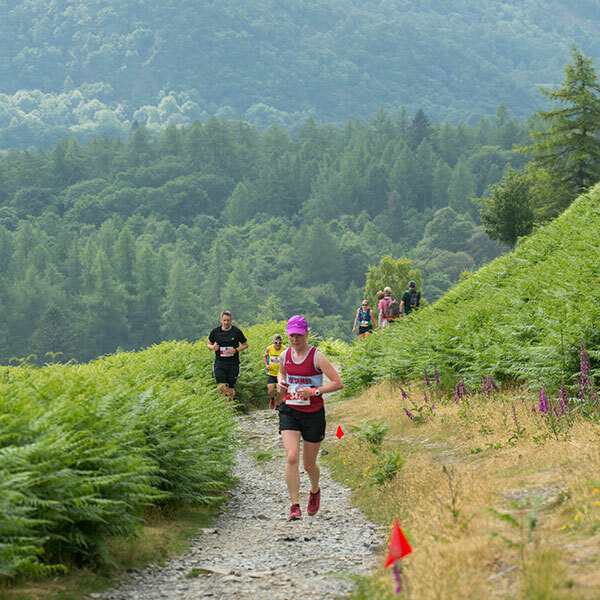 The road crossing takes you into Castle Crag Woods and then into Great Wood, taking the very European-like trails to run under Falcon Crag on the uber-technical rocky single track and to the 1st CP of the race. You’re then into the Watendlath Valley, stunned by this hidden gem and its amazing single track you will then climb out over Grange Fell and descend the fast and furious pack house trail to the Rosthwaite Institute to your 2nd CP of the day. Watered & fed by our expert marshals, you will then head north down Borrowdale arriving at the next CP/Drinks Station at Hawes End. From here you run the lake shore paths until Portinscale is reached and head back into Keswick via the Bob Graham Round finish. Once on the streets of Keswick you will be quickly directed by marshals to the finishing straights around the back of Crow Park to your glory finish back at the Festival site. 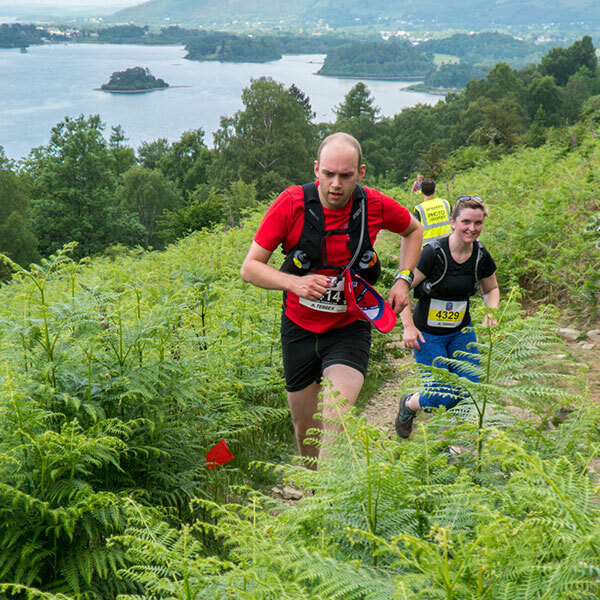 The 25km is full of surprises, giving you some of the best trails and views the Borrowdale Valley has to offer. A must for the avid trail runner! It is possible that events and courses at KMF may need to be amended at short notice due to weather issues, water levels, road conditions or road works. By nature, many of these factors are not possible to know well in advance. For each event there are a number of alternative options available which can be implemented at short notice. The organisers and race directors will always have athlete and spectator safety as the highest priority, and within that context will seek to provide the best possible experience. All sporting events would be impacted if the KMF Festival Village has to be closed. In this instance, as long as circumstances allow, all starts and finishes would be relocated to Lake Road and Lakeside Car Park and the events operated as smoothly as possible. The 25km route would be re-routed through Hope Park (north of Crow Park) to finish on Lake Road. The 25km course is extremely robust and will stand up to most weather. By using a dynamic process of route design we would create a course geared to the weather and ground conditions presented to us on the preceding day and actual day of the race. A bad weather route will be published closer to the Festival to be used in the event that the course needs to be adjusted. Finish at Crow Park taking in the fantastic festival atmosphere where your friends and family can watch you pass the finish line! Professionally organised by experienced events team. First aid kit to include: blister plasters/1 large sterile wound dressing and tape to secure a dressing. 0.5L fluid (A hot weather day) – we advise you take fluids anyway, as the first half of the course is very demanding. 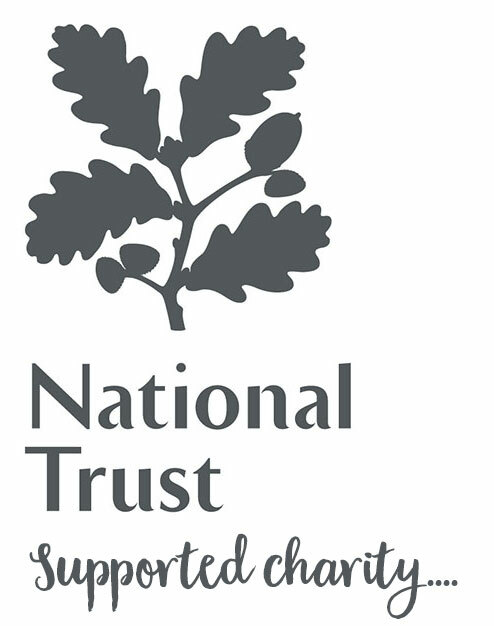 We strongly advise you wear good quality deep lugged Trail Shoes for this event! 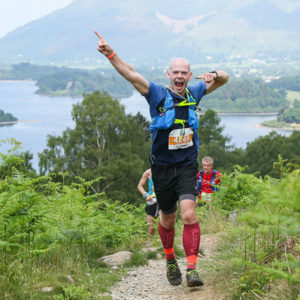 *The race director and Keswick Mountain Festival reserve the right to ask you to carry more clothing on the day of the race, depending on the weather conditions. This will be detailed to you via email in the run up to the race. Results Base will be timing the event using electronic timing chips attached to your shoes. There will be two checkpoints (CP) at Rosthwaite Institute and Hawes End. At both CP’s there will be a feed stations where you can fuel up with water and snacks. The route will be very well marked throughout, with RED Flags and A5 Arrow Boards at major directional changes, no navigational experience necessary. 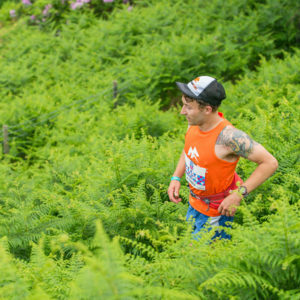 The 25k has a road crossing within 700m of the race start and whilst we know this is not ideal, its not possible to get you from the events centre start location to the superb trails of Great Woods and under Falcon Crag’s without this road crossing. In the 2016 race we had a queue to cross the road and so for 2017 we looked for a better solution to improve your enjoyment of the race, this consisted of a staggered start, allowing runners to set off in waves. This system has worked extremely well since and although it means you are racing in small blocks it allows us to group up similar speed runners together meaning you all have a great race on your hands! We have up to 8 waves to start on the 25k, meaning we can split you down into waves of similar abilities. This is mainly done by you estimating your completion time. Please remember if you haven’t done the route before it is a very technical race in the first half and less so in the second, this will mean you might need to adjust your ‘normal 25k’ time by a little. Don’t forget there is also 800m of ascent in the course, please take this into account. Below is the guide to how the waves are structured. You will be given the option of choosing your wave at the point of entry, please make sure you choose the most applicable wave for your ability. Please Note: The times in the chart above are a guide and you might find that you are in a slightly slower or quicker in reality than the wave you are running in. You will also note that the slowest wave is in the middle of the chart, this is due to the overall timing structure of the Keswick Mountain Festival as a whole. The 25km race can only start at 11:00, this is due to the complex structure of other events over the weekend and therefore we must work within the available timing slots we have. If we set the slowest waves off last, then some of those runners will be timed out. 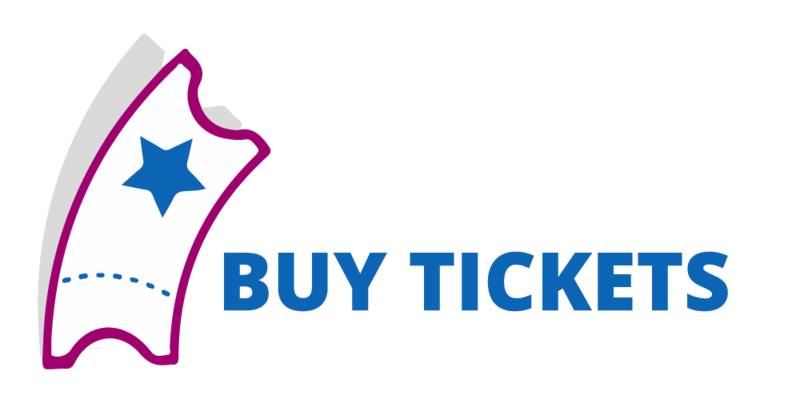 Early entry to the event will secure your most desired wave, if you find yourself entering late then we’re afraid you will need to pick the wave you feel is most suitable for you. Over taking is possible from Castle Head Wood, into Springs Farm and then Great Woods (early in the race), the track under Falcon Crags (the very technical track) is not an easy option for over taking, but once clear of that you can easily overtake in and beyond the Watendlath valley, after CP1.